More battery storage capacity is being added than ever before, but the pace of installation has slowed in the past 12 months. 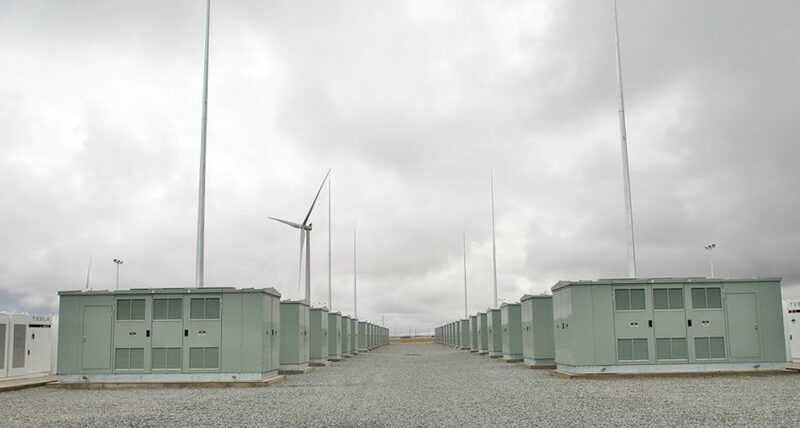 Pictured: The 100 MW Hornsdale Power Reserve facility in Australia. The battery has a total generation capacity of 100 MW, and 129 MWh of energy storage. This has been decribed as “capable of powering 50,000 homes”, providing 1 hour and 18 minutes of storage or, more controversially, 2.5 minutes of storage. The battery complex can be thought of as two systems. First there is a component with 70 MW of output capacity that has been contracted to the SA government. This is reported to provide grid stability and system security, and designed only to have about 10 minutes of storage. The second part could be thought of as having 30 MW of output capacity, but three-to-four hours of storage. Even though this component has a smaller capacity (MW), it has much more storage (MWh) and can provide energy for much longer. This component will participate in the competitive part of the market, and should firm up the wind power produced by the wind farm. The figure below illustrates just how flexible the battery actually is. In the space of four seconds, the battery is capable of going from zero to 30 MW (and vice versa). In fact it is likely much faster than that (at the millisecond scale), but the data available is only at four-second resolution. At the moment, these contingency services operate on three different timescales: six seconds, 60 seconds, and five minutes. Generators that offer these services must be able to raise (or reduce) their output to respond to an incident within these time frames. The final two markets are known as regulation services (again, as both a raise and lower). For this service, the Australian energy market operator (AEMO) issues dispatch instructions on a fine timescale (four seconds) to “regulate” the frequency and keep supply and demand in balance. One such service is so-called “fast frequency response” (FFR). While not a a direct replacement, it can reduce the need for physical inertia. This is conceptually similar to the contingency services described above, but might occur at the timescale of tens to hundreds of milliseconds, rather than six seconds. I suspect that the 70 MW portion of the new Tesla battery is designed to provide exactly this fast frequency response.